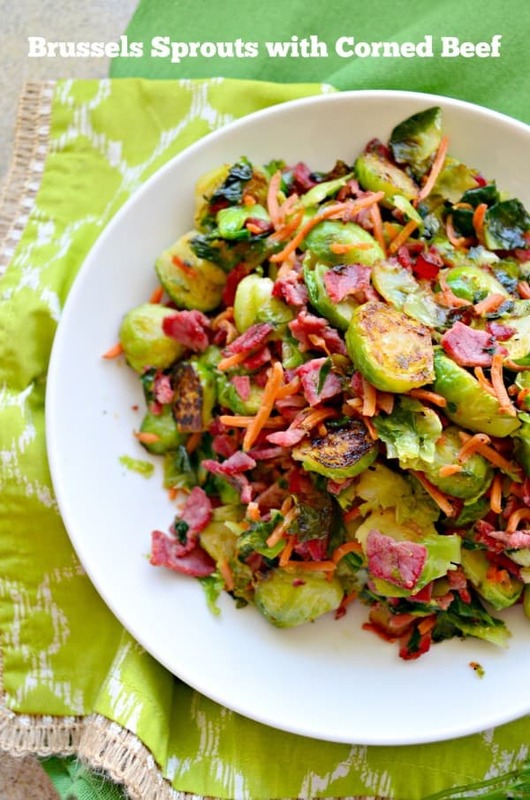 Brussels Sprouts with Corned Beef is an Irish-twist on two classic dishes; corned beef and cabbage — a unique Irish-style side dish. St. Patrick’s Day is this week! The day we celebrate with green beer and delicious Irish food! 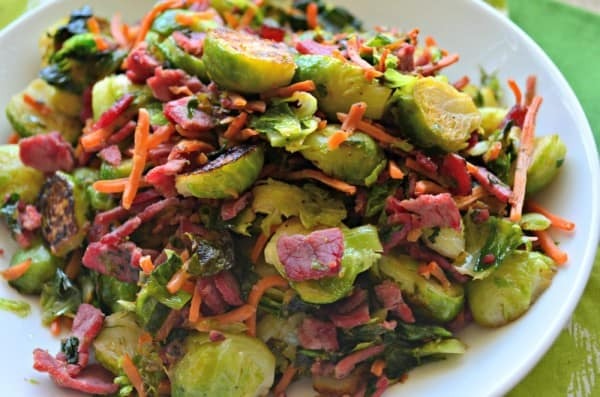 I had this idea to combine two of my favorite foods; brussels sprouts and corned beef to combine one flavorful and easy-to-make side dish. This recipe is really easy to make. The key to this recipe is rendered bacon fat. I always save my rendered bacon fat in a glass jar. It’s stored in my refrigerator and every time I notice it’s getting low I make more bacon to fill it back up. It’s my go-to secret weapon for most dishes. Just a spoonful amplifies the flavor to just about any dish. My husband use to think I was crazy, but now he realizes this is a staple and is the reason why so many of our meals taste so good. Everything in moderation of course. I’m not adding a cup full of bacon fat–that wouldn’t be healthy. But a spoonful or two won’t hurt you. 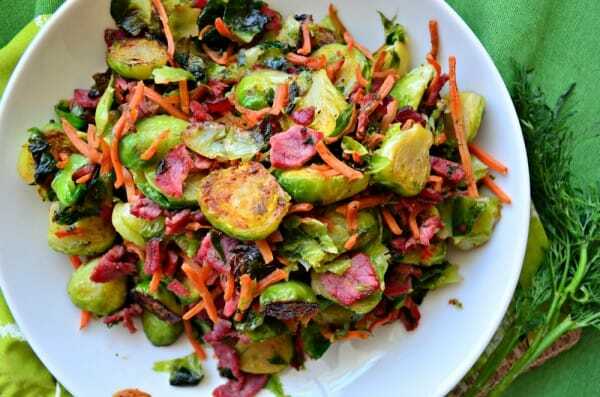 This is a quick cooking side dish, so you’ll want to prep your Brussels sprouts in advance. Simply run them under cold water. Cut off the stems and then halve the sprouts. Some of the tiny leaves will fall off. That’s perfectly ok. You’ll add those to the pan, too. I use 4 thick-slices of corned beef that I got from the deli. However, if you have leftover corned beef after St. Patrick’s Day you can totally use that, too! Either one will work fine. But fear not, when you want to make this recipe and you don’t have leftover Corned Beef this recipe still works. I also added in a little bit of shredded carrots. You can use a cheese grater and grate your own or buy the pre-shredded carrots found at your local grocery store. This recipe comes together in less than 20 minutes. It makes for the perfect side dish for just about any meal. The night I made this we ate this with baked chicken and mashed potatoes. We loved the salty-sweet combo of this side dish. I know that this side dish will make it into the side-dish rotation! In a large saute pan melt the rendered bacon fat and unsalted butter on medium heat. While the butter/fat melts clean, slice the stems off and slice the Brussels sprouts in half. Add the sliced Brussels sprouts into the saute pan and increase the heat to medium-high. Place a lid on the pan and cook for 5 minutes, mix well and then reduce the heat to medium add in the shredded carrots and 2 tablespoons of water. Cook for an additional 5 minutes, mixing periodically. While this cooks, diced the corned beef and set to the side. Mix the Brussles sprouts and scrape them to the sides of the pan. Reduce the heat to medium and add the diced corned beef and cook with lid on for 1 minute. Cook until crispy for 2-3 minutes; stirring constantly. Add the Brussels sprouts back in and saute for 1 minute on medium heat. Divide evenly among plates and enjoy!